For Chinese version, please visit us here. 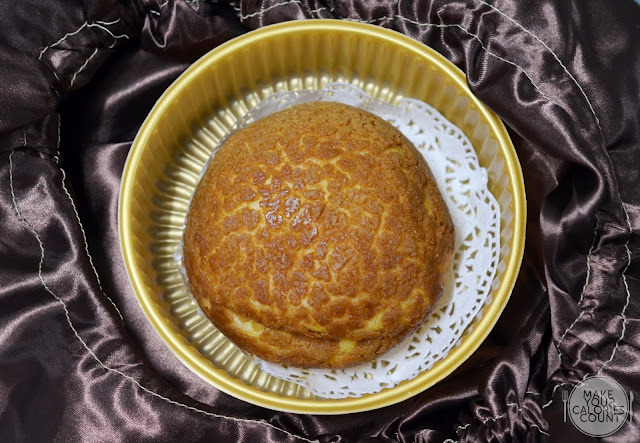 The craving for a good durian dessert brought us back to Goodwood Park Hotel and this time round, it was for their signature 'Mao Shan Wang Durian Power Puff'! 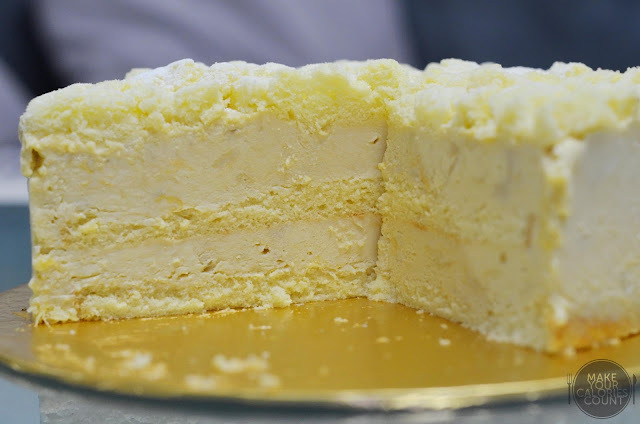 This time round, we also bought their legendary durian mousse cake which had been introduced since 1983! We were really impressed with how the power puff was being packaged and each came with a dandy cloth bag. The one thing that you would agree with me is that beautiful durian aroma which made us wanna rush home, get a nice cup of freshly brewed coffee and enjoy this as supper. 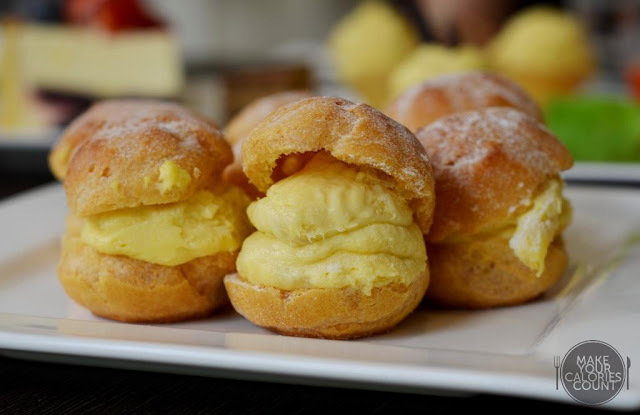 Blended with good quality cream, you could taste real Mao Shan Wang durian flesh contained within that crumbly puff. If you pry through the mixture, you could even find large slabs of skin of the durian flesh! It tasted bitterly sweet (more on the bitter side), so if you are a durian connoisseur, you should know what I am talking about! The durian flavours were so rich and fragrant that made each mouthful a satisfying experience. The letdown was again the puff itself (you could read more about the other puffs in our previous entry continued below), which was soft and limp. While the buttery fragrance was not really noticeable due to it served cold, the saltiness of the butter did leave an impression on our palate. Overall, we enjoyed the divine combination of the premium durian flesh blended cohesively with the cream. Quite frankly though, we would have preferred it more if they made do with the glamorous packaging and made the puff more affordable or at least provided the option to pay additional if you wanted the wrap for a gift. Afterall...what am I going to do with that pretty yet bluntly phrased, an uninspiring piece of accessory? 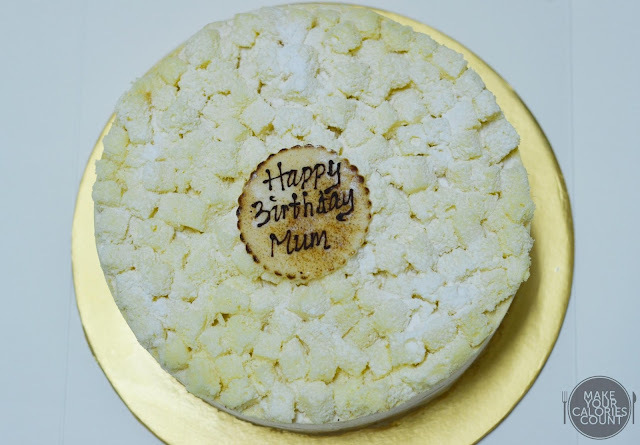 It was our beloved Mummy's birthday and we could not think of a better cake than this legendary durian cake which had been dedicatedly serving regular patrons since 1983! She would swoon at the mention of durians and indeed she was smiling from ear to ear when we surprised her with this! 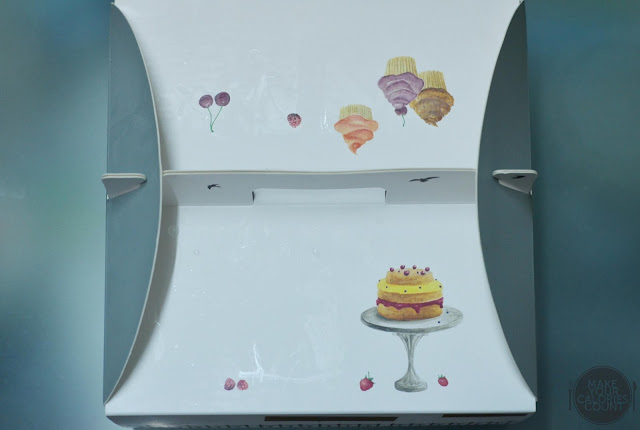 Regrettably, we failed to read the instruction label stuck to the beautifully decorated cake box and did not allow the cake to thaw before the birthday song! Despite being in the frozen state, it was a good contrast to how it would taste normally under room temperature tried at the durian fiesta buffet (read on below). It was almost like tasting a premium quality durian ice cream sandwiched between layers of soft delicate sponge cake. While it tasted rich and palatable with natural sweetness from the king of fruits, it appeared lacklustre having just tried the Mao Shan Wang puff. This was milder in terms of the richness but this was partly owed to the fact that the cake was semi-frozen and seemingly the aroma and tastes felt rather contained. On hindsight, it makes a yummy ice cream cake and personally I actually enjoyed this rendition better. 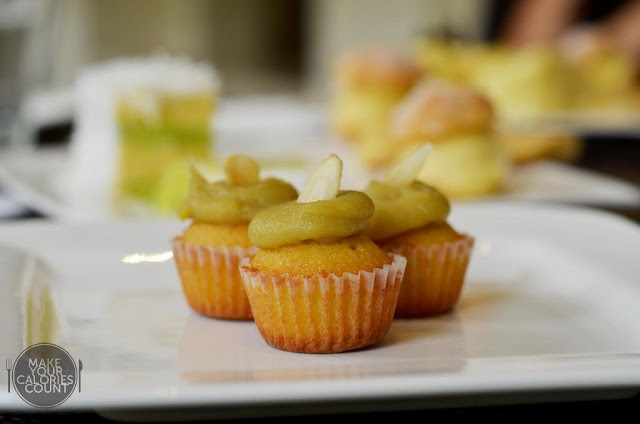 Do note that it would be highly advisable to make a reservation at (+65) 6730 1786 if you would like a full cake. We thought if there were enough people to share the cake, it would seem more value for money to purchase a full cake rather than an individual slice priced at S$11+. *This update was an add-on to the dining experience previously reviewed at the Coffee Lounge. Please continue reading for our review on the Durian Fiesta! 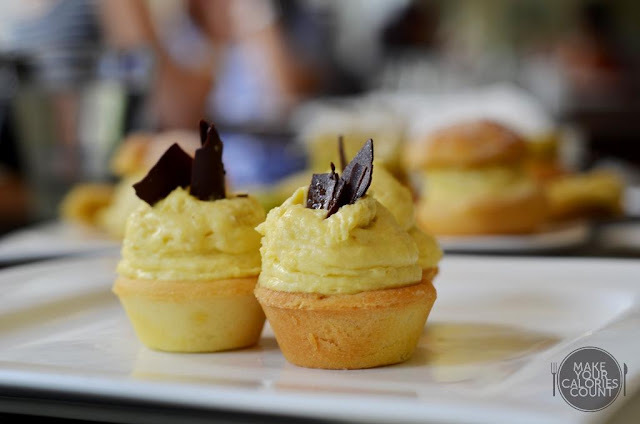 It was with great anticipation when we visited Goodwood Park Hotel on the first day of their dessert buffet with durian pastries at the Coffee Lounge. 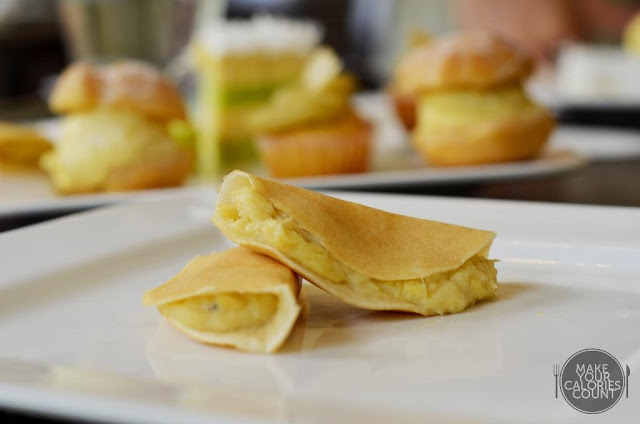 For a limited period only from 1 June to 21 July 2013, this ongoing lunch and dinner buffet will serve 6 of their signature scrumptious durian creations namely the Durian Puff, Durian Chocolate Hazelnut Tartlet, Durian Mousse Cake, Durian Pandan & Coconut Cake, Mini Durian Cupcake and a special live station highlight - Durian Pancake! The lunch buffet starts from 12 noon through to 2.30pm while the evening session starts at 6pm and ends at 10.30pm. For the dessert buffet with durian pastries standalone, it costs S$33.80+ per person, coming to an approximate S$40 inclusive of GST and service charge. 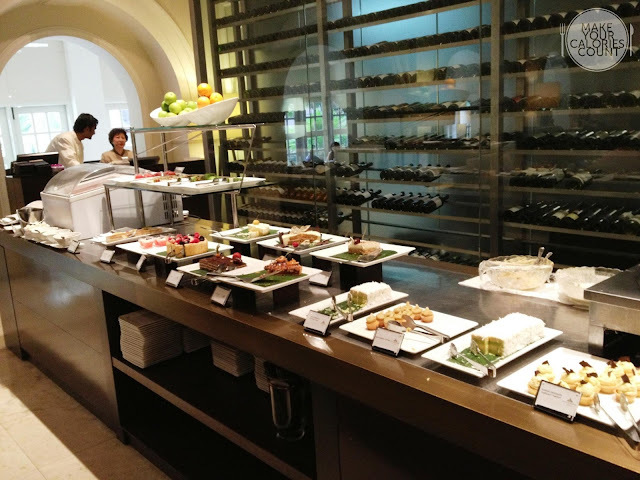 If you have any ala carte main course ordered at the Coffee Lounge, then you could enjoy the dessert buffet at an additional charge of S$26.80+. 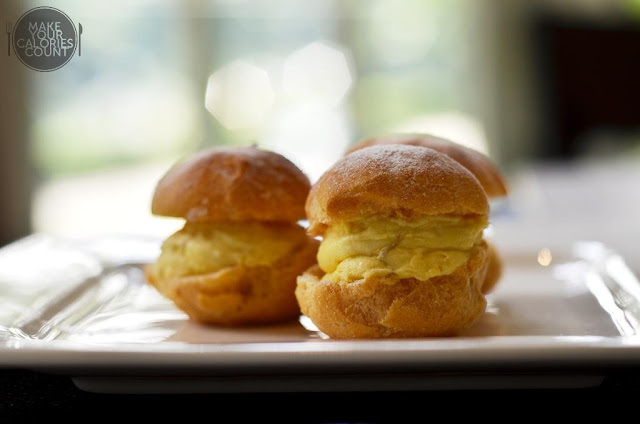 This was a simple, honest offering of the classic durian puff. The serving of the rich, creamy durian flesh in each puff was generous and plenty, leaving the puff 'gapping' open. The king of fruit is no joke when it came to flavours, with a touch of mild sweetness to please. Some might find it pungent and appalling but for us, it was divinely delicious. We enjoyed the fact that the creaminess of the puff was owed to the good quality durian flesh used and not from the addition of cream. While it could be pretty filling, especially the plenty of fibre in the durian flesh, it was pleasing on the palate rather than satiating on the appetite. The puff pastry on the other hand felt like pre-made shells and not as fresh and crusty like those freshly made cream puffs one would enjoy elsewhere. It seemed too 'airy', hollow and did not have a solid crust and crispness to the texture. 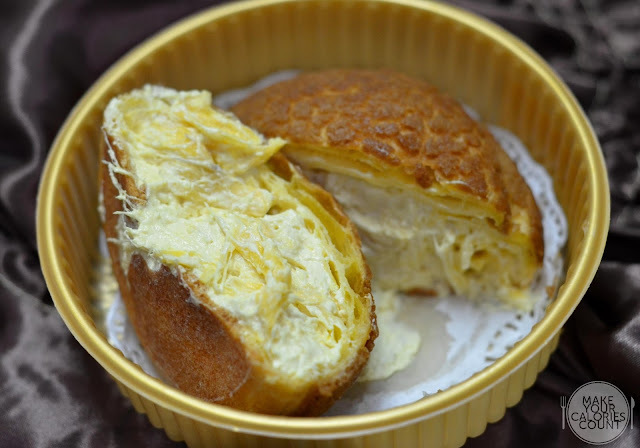 There was also very little butter flavour and taste to the puff to make it a good pastry on the whole but the limelight was nonetheless that beautiful durian fruit. I would not go on further to rave about the durian flesh and cream for they were the same ones used universally across the various durian pastries, apart from the one for pancake but we will go onto that later. I liked the size of the tartlet, making it bite-sized, but I struggled to taste the flavours of the hazelnuts for the generous portion and flavours of the durian flesh overwhelmed. The chopped up hazelnuts contributed to the crunchy texture of the mouthful while the tartlet was again mediocre. 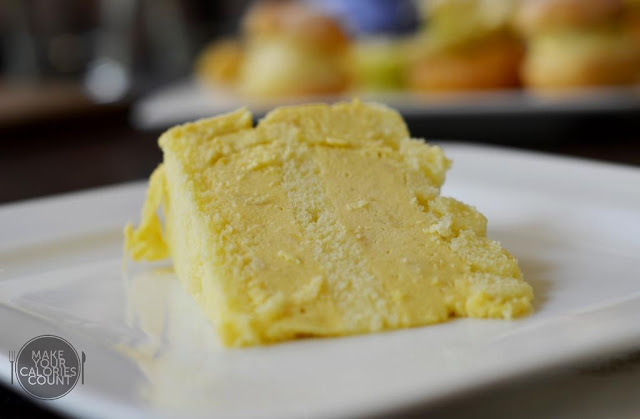 Alternating between layers of sponge and durian mousse, the creaminess from the durian mousse complemented the sponge cake to make it a good combination. 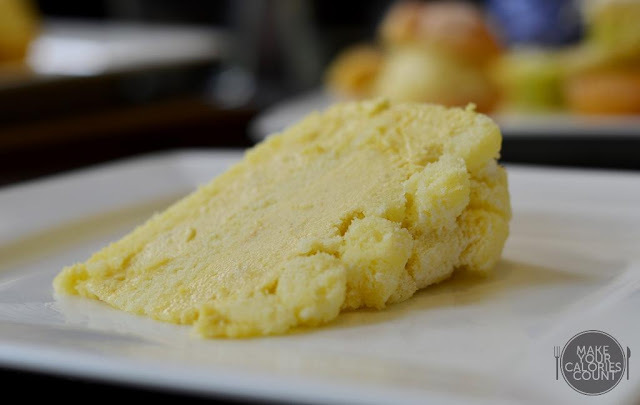 The durian mousse was almost melt in your mouth and the sponge cake was soft and moist. It was a classic example of a simple cake made illustrious due to good quality ingredients. It was a shame though that Coffee Lounge stopped bringing out new cakes to replace the finished tray at the buffet bench even 20 minutes before the end of the service. Personally I enjoyed this cake the most amongst the offering of durian desserts at the buffet. The layer of coconut shavings atop a rich cream gave the cake a beautiful texture with an added crunchiness to the smooth and moist cake. While some might argue that finer shavings would do the cake better justice, I actually enjoyed the coarse shavings which defined the varied texture prominently. The alternating layers of sponge and mousse was similar to the durian mousse cake only this had a fragrant pandan sponge cake. 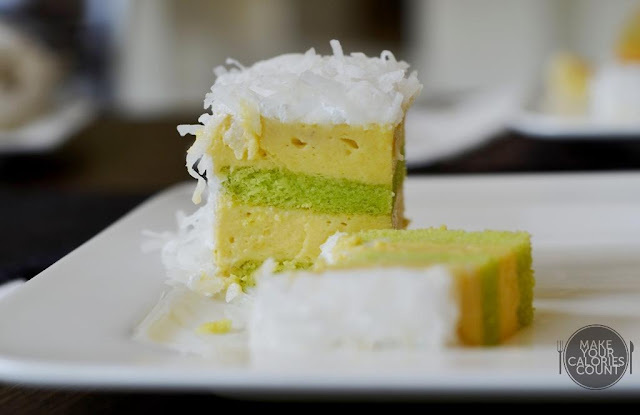 It tasted very South-East Asian with a nice blend of durian aroma complemented with the enticing fragrance of pandan and the coconut shavings were really the icing on the cake to sum up a good dessert. 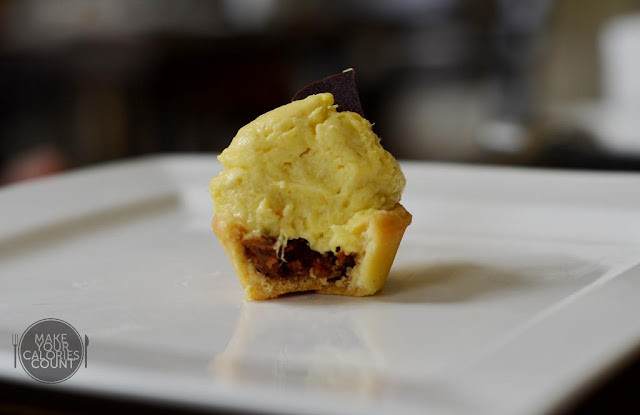 The cupcake was plainly butter and just had a topping of the durian paste that had a tinge of pandan flavour so it, with a slice of almond flake. For some reason, it tasted like 'kaya' to us probably cos of the infused pandan. This I suppose was meant to be the usual frosted icing on cupcakes. Regrettably, the cupcake on its own tasted dry. Well the best verdict is probably we did not quite felt like getting a second serving of the cupcake after the first try. 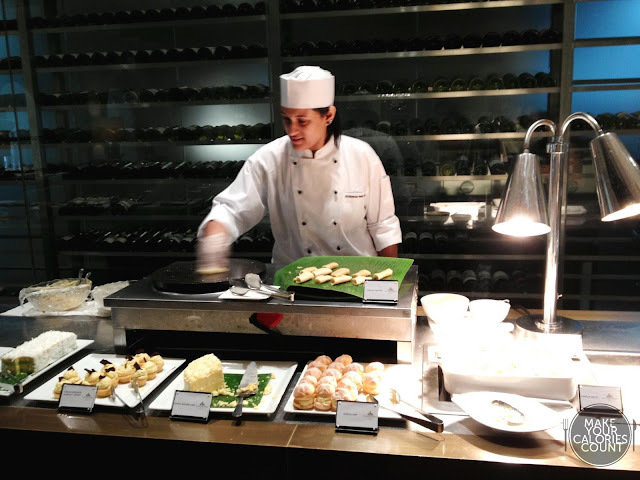 The durian pancakes were freshly made on the spot by the chef at the counter so it was as fresh as one could possibly ask for! We also tasted that the durian flesh used was slightly different in a good sense, with a good balance of sweet bitterness from the durians. This tasted more like 'Mao Shan Wang' premium durian. The pancakes were thin and very soft on the inside with a slight crisp. The filling was generously applied to the extent that it was almost spilling out of the pancake when we tried to savour it! Quite frankly, the rest of the items on the dessert bar apart from the durian pastries were mostly of mediocre standards and we struggled to finish them. 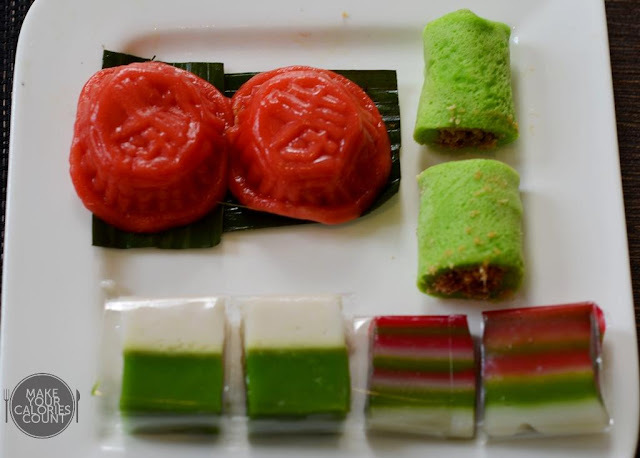 What we found surprisingly familiar was their offering of traditional nyonya kueh, which looked and tasted like they were catered by Bengawan Solo. 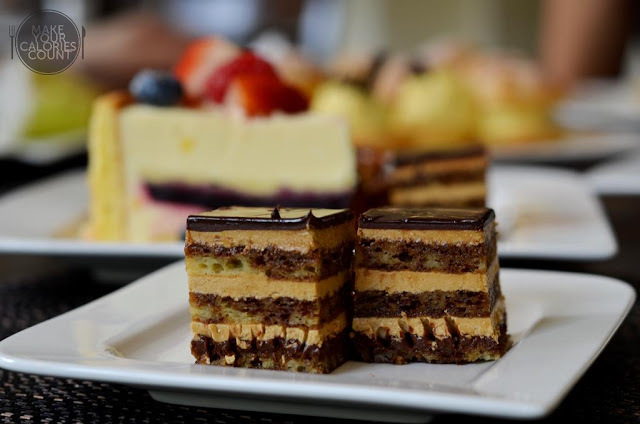 The opera cake for instance had good layering of creme, mousse and sponge but it was too sweet for our palate and somewhat lacked oomph. 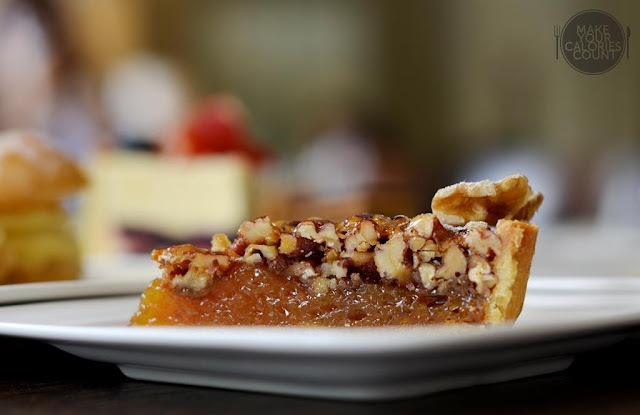 The pecan tart had good amount of pecan nuts to give the desired crunch but the somewhat jellied caramel base was too sweet and 'lumpy' and the pecan slice quite simply lost its shape and form upon the first bite. I am not going to rate the respective desserts individually for in our humble opinion, they were not really worth the calories and the limelight for the dessert buffet was really the durian pastries. The offering of the dessert buffet was actually quite limited, though local favourites like pulut hitam or even the mango pomelo sago were on the bench. When we saw the ice cream counter, we thought there might be durian ice cream but to our disappointment, only the familiar strawberry and couple other normal ice creams were available. The speciality durian ice cream was only available on the ala carte menu which was not included in the price paid for. In general, we felt that at about S$40 per person, it might be better off for you to head few steps down the alleyway and buy some of the durian pastries from the takeaway bar. With just 6 types of durian desserts offering and not all of them being 'MUST-TRYs', it might be more value for money to just buy the selected desserts on its own as ala carte. The serving staffs were very attentive to our needs, refilling our glasses whenever there was a need to without requesting. It was also easy to seek their attention and the gentleman humbly thanked us for visiting when we were leaving. The durian strudel as a whole at S$56+ and the signature 'Mao Shan Wang' Power Puff at S$16.80+ were but some of the more enticing offerings which we would return for takeaway orders but I believe it might be our last visit for the dessert buffet. 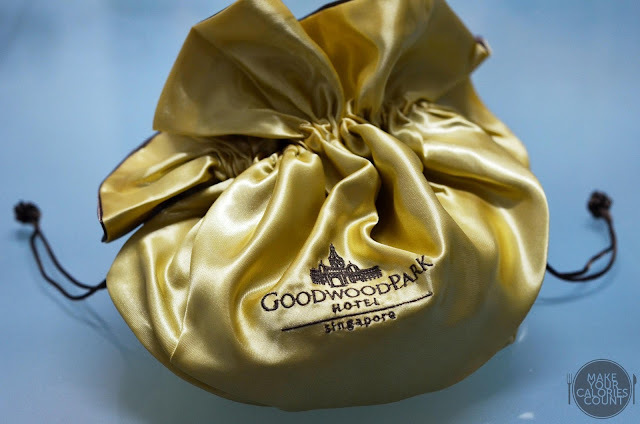 P.S: For those interested to make purchases at the takeaway booth, you may wish to have a look at the flyer distributed by Goodwood Park Hotel, which include the relevant prices for each pastry here.